Churg-Strauss syndrome - is a granulomatous-necrotizing vasculitis, which affects blood vessels of small and medium caliber involvement in the process of the respiratory tract, the clinical picture of asthma andeosinophilia. Occurs in both children and the elderly, but most frequently in the period from 35 to 45 years. Epidemiology. Is about 20% of all vasculitis. In the course of the disease conditionally distinguish 3 main phases. - Various allergic reactions: rhinitis, hay fever and astma. - Blood and tissue eosinophilia. - Eosinophilic pneumonia or eosinophilic gastroenteritis. In the third phase of the clinical picture of the disease to the forefront signs of systemic vasculitis. Syndrome of bronchial hyperreactivity. In most cases, it precedes the clinical manifestations of systemic vasculitis. Often there is connection with the development of pulmonary infection infectious-dependent forms of asthma and BEB. Pulmonary infiltrates detected in two-thirds of patients. One third of the patients revealedpleurisy with eosinophilia in the pleural fluid. Gastrointestinal: abdominal pain, diarrhea, and sometimes bleeding. Complications: intestinal perforation, peritonitis, intestinal obstruction. Cardio-vascular system: various ECG changes detected in almost half of patients who develop acute orconstrictive pericarditis, cardiac failure. Changes in the skin are one of the most characteristic symptoms of the disease. These include nodules, purpura, erythema, urticaria, skin necrosis, and livedo reticularis. Renal disease occurs less malignant than in Wegener's granulomatosis or UP. May develop nephritis. Joint damage in the form of arthritis or polyarthralgia. Characteristic not progressing migratory arthritis of large and small joints. Occasionally there are myalgia and myositis. 4) can be GBV (proteinuria, microscopic hematuria without renal dysfunction). 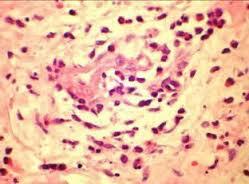 8) eosinophilia (15-85% eosinophils in the peripheral blood). Observed correlation between the level of eosinophilia and severity of clinical manifestations of asthma andvasculitis. Occur normochromic normocytic anemia, leukocytosis, accelerated ESR and CRP increase. Inpatients with single-and gipokomplementemiya increase in CEC. Depending on severity of the disease, prednisolone administered in a dose of 40-60 mg / day for several weeks, with a gradual decline. Despite the relative goodness of the inflammatory process, achieving a clinical effect is often necessary long-term use of high doses of the drug. Cancel GCS possible not earlier than one year from the start of treatment. The lack of effectiveness of prednisolone use cyclophosphamide, azathioprine, hlorbutin in conventionaldosages.